Noemi Vidal has returned to her planet, Genesis, as an outsider. Ostracized for refusing to sacrifice Abel, the galaxy's most advanced mechanical man, she dreams of traveling through the stars one more time. And when a deadly plague arrives on Genesis, Noemi gets her chance. As the only soldier to have ever left the planet, it will be up to her to save its people...if only she wasn't flying right into a trap. Abel, now fully aware of his soul and captaining his own ship, never thought he'd get to see Noemi again, not when the entire universe stands between them. But when his creator, Burton Mansfield, delivers news of Noemi's capture, Abel must go to her, no matter the cost. Confession: I still have not read the first book in this series. I just haven't had a chance to get to it yet. I'm hoping to soon, however! 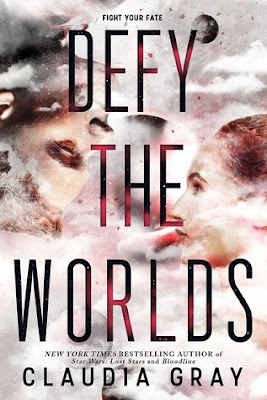 And I can't wait to add Defy the Worlds to my collection as well. I know I will love them both! Still need to read the first one to this series!! Can't believe they changed the cover again! It's like they went back to the first idea! I rather liked the hardcover one! The colors were so much prettier! I'm actually quite excited about @paperfury's novel coming out in June - A Thousand Perfect Notes. January Wrap Up & Book Haul! Happy 7th Blogoversary to ME! !